Sun-woo takes Min-young home in the car and she comes down with the dreaded Korean Rain Disease. He starts unbuttoning her shirt, when she asks if they first met in the ER. Flashback to him knocking her out by hitting her with a door and then taking her to the ER. He yells at her for being drunk and throwing up while she stares at him, mesmerized by his hotness. We return to him tucking her into bed wearing one of his shirts. She remembers her original lawyer stepfather in Boston. He offers to handle things any way she likes, continue as family, meet secretly, or go away somewhere and live together. She sleeps and he looks up to see the writing on his guitar starting to disappear. 1993 self is wiping it off and putting something new: Did you get it? What I sent you? He checks his journal for an explanation. 1993: Teen Sun-woo finds a package in his room [14:18] which the housekeeper says the police had left because it had his fingerprints on it. It's the burned incense case. Inside it are two unburned sticks. 2013: Adult Sun-woo looks in the closet and finds the case. He remembers that in 1992 he purposely left it on the table at the hospital, and now it's found him again. The adult is intercut with the teen leaving the incense in a box of mementoes and finding it. At the hospital Young Dr. Boyfriend sits dejectedly. He tells Dr. Han that Min-young is missing, not admitting that she broke up with him. Sun-woo calls then to ask Dr. Han for help with the rain sickness. When he arrives Sun-woo tells him that he has the incense again, Min-young remembers, asks him to talk to her (thanks a lot pal), and takes off to see hyung. 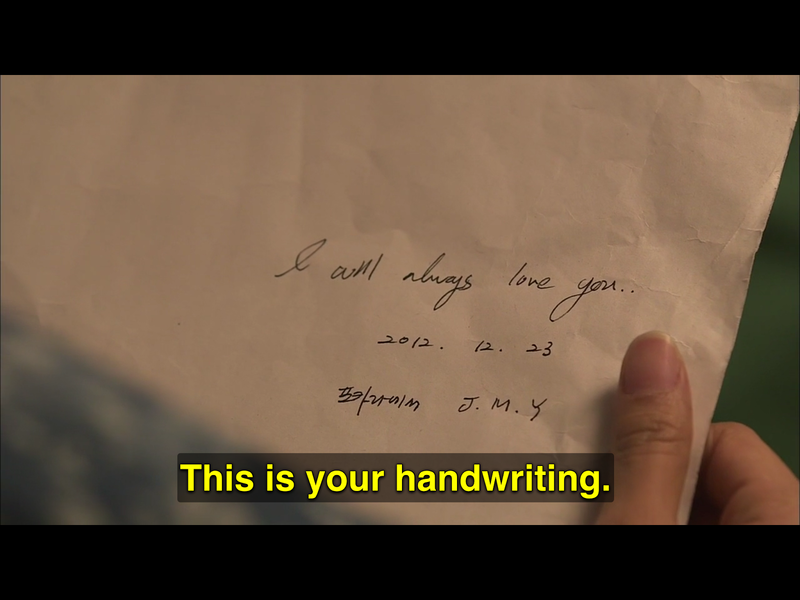 When Min-young wakes up, she asks Dr. Han if he knew. He says yes, and she asks “Why did you introduce me to someone, since I was already married?” So they really got married then. I wondered. Dr. Boyfriend has just confessed his fight with Min-young to hyung and left his office, when Sun-woo arrives. There are several shots of hyung framed in the desk mirror. (Meaning he is not a real person but only an image?) Sun-woo tells him that he and Min-young are married and that hyung is not her father. Also that hyung had wanted to save their father's life and get his girlfriend back, but died a year ago in the Himalayas. Then Sun-woo hands him the incense, explaining it sends you back twenty years. [27:52] Hyung remembers Min-young in 1992 telling him she didn't know the person who gave her the phone number, and then remembers a stranger coming into his father's office that night. He had run off, but the stranger (who he now recognizes) had followed and suddenly disappeared. He remembers modern Sun-woo beating him up at the restaurant and afterwards calling him up and accusing him of making him lose his father and mother and his girl, deserting him, and then turning up dead. And it had made him waste time hating Dr. Choi, who has now become a monster and may turn out to be hyung's biological father. He wants hyung's agreement to go back and straighten things out. Hyung mopes around all day thinking it through. The top button of his shirt is undone; he's been loosening his tie and squirming. We see Sun-woo's watch reading 2013, 10 April, 7:02, Wednesday. Hyung calls to say he believes the story. Does that mean he doesn't remember the original timeline yet? He regrets what he did bitterly and authorizes Sun-woo to go back and convince his younger self to turn himself in. Sun-woo doesn't want Min-young to pay for the brothers' mistakes. We see him uploading the videos he made the night of the fire, from a USB to his computer and onto a VCR tape. (It's run all the way to the right, which means it's at the end. heh.) Hyung asks if things will be ok and he replies it never goes the way you think it will. Hyung asks if his wife and daughter were happy in that time. He'll lose them now, but he wants things fixed before the wedding so it will be easier for Yoo-jin. And he wonders if this is his last day. He takes Yoo-jin out to dinner, drinking her in with his eyes. She mentions that their anniversary is in two weeks, so they have two weeks to change things before the 1992 wedding. In 1993 hyung is minding the store when Dr. Choi calls him, with the photo of Sun-woo that Evil Minion had gotten from the optical shop security camera. Suddenly 2013 Hyung, sitting at the restaurant table, gets a new memory flash of that scene. Running count – time travels: 12; remaining incense sticks: 1; Timelines: Past6, Present4. We start up with the kiss and the montage from April 7, then Sun-woo tells Min-young not to ruin her life and goes to talk to Dr. Boyfriend, who is banging on the gate. He fobs him off; says the record is his, those initials are his ex-girlfriend's, and generally tries not to mess up the engagement. He calls a taxi; she sits in the back watching his reflection in the outside mirror. He lets her out a block from her house, tells her that girls often get nervous right before their wedding, and leaves watching her in the mirror. The next day she recalls that he said his girlfriend had amnesia and turned out to be family. [15:45] She calls him again but he sticks with his story: it's not real and it's disgusting. Jump to Dr. Choi on April 9, 1993 at 2 pm. He calls hyung to his office and tries to get him to go to America. Hyung asks if Dr. Choi loved his mother when he was young. The answer: we all liked her. 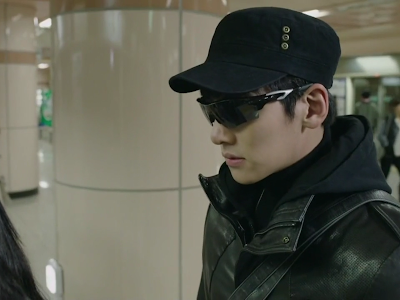 Hyung goes to see his fiance, Yoo-jin, at her record shop. She tries to get him to go and he tells her also that he won't. Jump again to Dr. Choi on April 9, 2013 at 2 pm, getting out of his court hearing. He will likely get ten years. Chief Oh comes to congratulate Sun-woo and invite him out to celebrate their win. He tells him again to get his headaches treated. Yoo-jin comes to meet him in the foyer, saying hyung is taking depression meds and can't sleep. She wants them to make up but he refuses, saying they both are having a hard time. A dark city-scape shows us it is night. Dr. Choi's lawyers advise him to stall and counter-sue and delay the verdict. Trials are all about time, they say. Nice thing to say in a time-travel show. He yells at them it won't shorten the verdict and to just end it. They hang their heads lol and he pulls the kdrama tantrum of knocking everything on his desk onto the floor. Back in 1993 Evil Minion [32:00] brings Dr. Choi the CCTV footage of Sun-woo paying for his mother's glasses at the optical shop, and they get a look at Sun-woo's face. Present-day Choi gets the new memory while dozing in his chair reflected in a small desk mirror. Ha. He doesn't realize it is a new event, he thinks he just suddenly remembered it. His 1993 self remembers bumping into that man outside the hospital and driving away looking at him in the rear-view mirror. His 2013 self puts those memories together and recognizes the man as looking like Sun-woo. Sun-woo tries to be friendly with the lady anchor, but as they walk out together at the end of work he gets a call from Dr. Boyfriend saying he and Min-young had a fight and she is missing. The wedding is in three days, and he's worried. Actually she called it off. Sun-woo goes back into the office, sets his assistant to trying to contact her, and runs around town in the rain looking for her. He probably thinks she is doing something rash. He goes home and finally at 3 am she calls. She explains how frustrated she is with this memory becoming clearer; that she even called the hotel in Nepal but they had no record of them being there. He asks where she is and she answers, “Where Joo Min-young first kissed her love of five years.” A flashback shows her drunk at a playground with some co-workers. She called him and when he arrived she tumbled down a slide, landed on him, and kissed him. 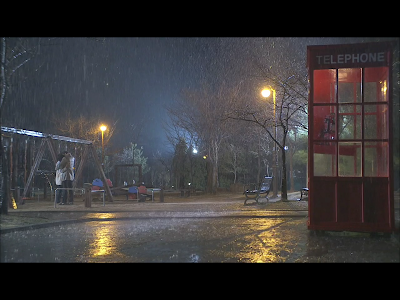 After we get a look at a red Dr.-Who-Queen-Inhyun telephone booth, he shows up at the playground. It is still raining and they are both drenched. She asks how he knew where she was. He replies, “You said it was our first kiss.” Now she knows he knows, and he knows she knows he knows. And we know he knows she knows he knows. He goes on, “You know the word I hate the most in the world? Uncle.” I love that line. It's eminently quotable. He pulls her in and kisses her and they wrap their arms around each other. Up until now everyone except Sun-woo and Dr. Han have been oblivious to the timeline shifts. Hyung doesn't remember that he had been lost in the Himalayas. Because he married Yoo-jin he didn't ever go there. Chief Oh doesn't know Sun-woo had cancer once upon a time, because Young-hoon found the pills and they treated the tumor immediately. Everyone had been dropped into a new life and gone on blissfully as though it had always existed. (Does anyone wonder what happened to Min-young's original stepfather?) But now two new people can perceive the shifts. Min-young remembers things she knows are different from the present but she doesn't know why; and Dr. Choi thinks he suddenly remembered something he had forgotten. The new memory didn't conflict with his present, so he doesn't know there are different timelines. However there is now a new one. Timeline Past5 started because Young-hoon found the pills, which caused him to change his actions. Timeline Past6 has now started because Dr. Choi knows something that will change his actions. Running count – time travels: 11; remaining incense sticks: 2; Timelines: Past6, Present4. Three months have passed, it is April 7, 1993, and teen Sun-woo has just come home from the hospital. His mother sits in a wheelchair staring into space and only paying attention when someone touches her. The maid impresses me as being very gentle. Hyung has gotten engaged and turned the hospital over to Dr. Choi. Sun-woo wonders into his journal if his older self is reading it, or will ever visit him again, or is even alive. Older self reads the journal while pouring boiling water. He suddenly gets a searing headache, spills, and burns himself. No more tumor but still has headaches? And how about that journal? It must be a real kick reading that thing every so often, watching the entries change. In the tv station dressing room Sun-woo stands before the mirror taking pills. His hand is bandaged, but he doesn't favor it. His boss, Chief Oh, comes in saying it is his first night on air and he is the youngest anchor at CBM. [8:30] We know he has been on air already in this timeline so he must be moving up from late night anchor to prime time. Hyung watches Sun-woo's anchor debut at the hospital, looking pensive. He seems fond of his brother, but unhappy. He makes an excuse to not attend Min-young's wedding but gives her a present of a hi-fi with a turntable. Dr. Boyfriend puts it together and finds the Record from the Past. It looks like her house is the green one of that row of cute colorful townhouses. Boyfriend finds a note written on the record sleeve: I will always love you, JMY and the date when she was in Nepal. He accuses her of cheating on him, and when she copies the note she starts to remember writing it. She was sitting at a table and Sun-woo was in a bed behind her. She recalls him saying he had made Joo Min-young into Park Min-young. Ah! It's coming back. Sun-woo suddenly starts seeing messages appearing, [38:18] on his guitar, over the door, on the metal railing. Split-screen shows teen self carving it and adult self following along reading. Min-young is starting to remember the original timeline, but she isn't getting a flood of memories the way the two others did. Perhaps that is because their brains were adjusted by knowing about the time travel. She is breaking the barrier herself and it comes slowly. Running count – time travels: 11; remaining incense sticks: 2; Timelines: Past5, Present4. December 31, 1992. Min-young's mother brings her to the 10 am funeral for Sun-woo's father. Dr. Choi comes and tries to calm a very nervous hyung. Mom admits that there was a witness that night. She had seen him before, when he had broken and replaced her glasses. This actress does an amazing job of going from looking healthy and pretty to being tired and wan. December 31 (labeled 2013, but that can't be right) 10 am as well. Dr. Choi goes to the DA's office to testify. He wonders to himself if the witness could have been the person who gave Sun-woo that thumb drive. Meanwhile, Dr. Han sends Min-young away. She drives off watching him in her rear-view mirror, and then he calls an ambulance. Back in 1992, Sun-woo is laid up in the hospital with burns. [10:20] When hyung comes to see him he blames himself for the death of his father and hyung can't bring himself to say anything. The scene shifts to 2012 hyung reflected in a mirror in his office, remembering that day and printing out a resignation letter. Min-young shows up to tease him to go out for lunch. She supplies him with an excuse for the fight that might appease her mother: money. When they get back to the hospital they meet young Dr. Boyfriend and his parents. We see him first in the side mirror of his car. He has such nice teeth. His parents seem a little in awe of her father being chief of surgery. Meanwhile, Sun-woo wakes up in the hospital after having a procedure to lower his intercranial pressure. Dr. Han discusses his case with the specialist, who is appalled at the swift tumor growth. Yes, we are all appalled. We can easily see a difference in the scans. Hyung returns to his office and signs his resignation form in a perfect, slightly sloppy English scrawl: Park. Out of an otherwise empty drawer (how can it be that empty – aren't drawers always chock full?) he takes a medicine bottle and syringe and pulls the cap off, reflected again in his mirror. But he is interrupted by Sun-woo on the phone. He tells hyung to be a good husband and father, visit Mom, and not take drugs. Otherwise his life is a waste. Then he drops the phone and collapses onto the floor. Skip to 1992, December 31 at 8 pm; young Dr. Han shows up at Sun-woo's house to find it full of relatives and is told that his dad had died and he was in the hospital. Split-screen to 8 pm 2013, Dr. Han is waiting in a hallway, crossing himself. The nurse comes out to report severe swelling and the necessity of immediate surgery. More split screens of both Dr. Hans running up halls and down streets to different hospital doors. We have touching parallel scenes of Sun-woos opening their eyes to look up at distraught Dr. Hans. Young Dr. Han breaks down in tears to hear Sun-woo's story. Aww, he's such a sweetie. Adult Sun-woo tells his Dr. Han that he signed the papers because he knew Han would just forge his signature if he didn't. “Just kill me in peace,” he says. Hehe, cheeky to the end. 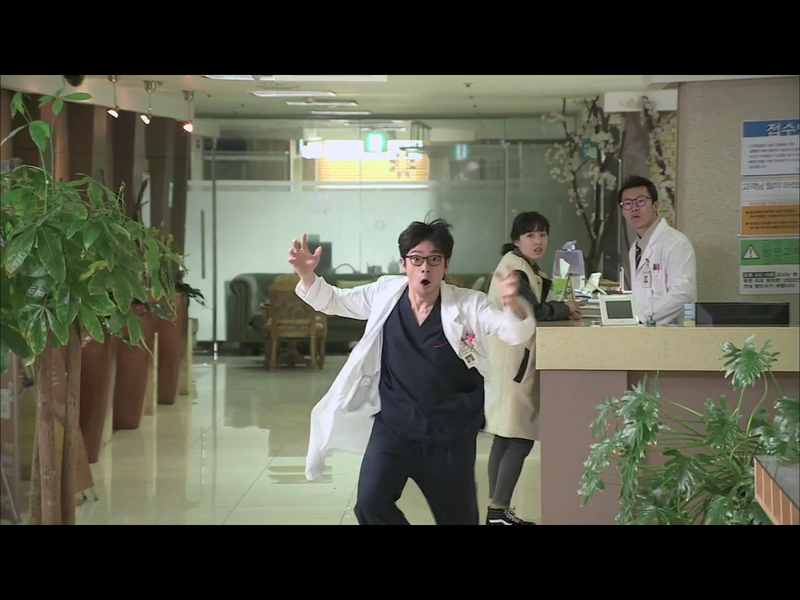 Dr. Han claims passionately that he will save Sun-woo. 2012 Sun-woo is prepped for surgery. The bandage must be from that procedure they did. 1992 Sun-woo tells Young-hoon that he was warned that his father would die and it really happened. He is supposed to meet future self to find out about another person who will die but is hospitalized, so he asks Young-hoon to go. Adult Dr. Han tries to call Min-young but she is covering a New Year's celebration and doesn't hear the phone. It reads 2012 on the banners, just sayin'. Young Dr. Boyfriend calls her, and I am glad to see that Sun-woo isn't the only clueless tactless guy in this story. He tells her his parents want them to get married. She tells him it's too noisy and hangs up. And may I say that I really don't like her hair. Young-hoon waits, freezing, at the school grounds for two hours, poor kid, while young Sun-woo goes over and over the things his adult self had said: there is another life you must save; we need to have a long conversation for you to have a normal life. [36:40] He realizes that the person to die is himself. Young-hoon returns to Sun-woo's house to check the pager. Nothing. He doesn't want to accept that there is nothing he can do. The surgery in 2012 takes too long, things start to go wrong, and the doctor decides to close. Dr. Han can't give up and takes over but Sun-woo's heart stops. They did a good job simulating surgery, even including a red patch on the skin where the defibrillator was. They pull the sheet over the body and turn off the operating room lights as Young-hoon turns off the light in Sun-woo's 1992 bedroom. Dr. Han sits, defeated, in the 2012 breakroom. And he looks really different without his glasses. Min-young calls and he tries to tell her what happened when he is suddenly flooded by new memories. That night in 1992 he had found a packet of pills on the floor. Adult Sun-woo had dropped it during the scuffle with teen Sun-woo at the start of episode 7. It was labeled with the name of a hospital that didn't exist yet. Young-hoon called Sun-woo in his hospital room and described the pills to a doctor who said they were for brain tumor. Dr. Han high-tails it to the OR, where they are cleaning up. They tell him the patient was taken to the ICU. He chases down a gurney with a patient covered in a sheet. Fearfully he uncovers the face – it's someone else. Why would they take a deceased patient to the ICU? The subtitles must be wrong. A door swishes open and he looks up to see a television in an office. On the screen is Sun-woo reading the news, a little wooden and wide-eyed. Dr. Han exults that he saved Sun-woo's life. I am not sure why we keep seeing people caught in a mirror; perhaps because these people have been caught up in time-line changes. Perhaps just to point out that there are several scenes in this episode in which events are mirrored from 1992 to 2012. It emphasizes that time is moving in parallel. We do not have any time-travel in this episode, but we have change caused by it. Finding the pills in 1992 changed things, but no one remembers it and nothing changes, until the parallel moment exactly 20 years later. Because they found out about the brain tumor they now watch for it and treat it early. We have moved to a new timeline and Sun-woo is alive again. Or did he ever die? He got treated and didn't die of a brain tumor at all. The old time-line dissolved and is gone, leaving only the new one. Dr. Han remembers it though, so I assume Sun-woo does. Sun-woo appears in his 2012 car, hyperventilating. 1992 hyung looks up, amazed that the madman has disappeared. Sun-woo drives straight to the restaurant where hyung is and procedes to beat the crap out of him, and then collapses again. Min-young reads the news. They say again that it's the 31st and the last show of the year. That doesn't really fit with being the night of Dad's death, which was the 30th. Usually. She gets permission to read Sun-woo's prewritten closing because it was his last show. It says, “History of mankind proves that the arrogance of a man, of believing he is the only one who could change the world, has led many heroes to their doom.” If that's not a comment on the drama I don't know what is. And I loved it when the two staffers complained that Park Sun-woo was their boss' favorite and could get away with anything. Hahaha! They take Sun-woo away in an ambulance but he pulls the drama trick of ripping out the IV and running off. He calls hyung and yells at him for lying for 20 years. Hyung says that Mom would not let him take the blame. Tears. Sun-woo retrieves his car and drives to the hospital again to light an incense stick for the third time that night. [eleventh time travel - 15:45] At 1:30 he walks into the office, empty except for Dad lying on the floor in a pool of blood. More tears. He retreats to the break room to review the recordings, and watches Dad accuse Choi of being hyung's father. Mom slaps Dad, Dad slaps Mom, Dad strangles Mom, Mom shouts. Sun-woo can't look, and we don't see it either. Choi comes in to start the cover-up. Hyung goes back to his girlfriend's house, lets himself in, and crawls under the blanket with her and her daughter as they sleep. 2012 Hyung staggers into his office for more propofol. 1992 Evil Henchman comes in with gasoline and starts the fire as Sun-woo watches on his screen. He suddenly recollects his teen self should be showing up soon and is outside by the time the kid arrives. We see him blown back by the blast again. Back in 2012, Sun-woo visits Dr. Choi to apologize for suspecting him of murder and accuse him of arson and blackmail. He gives Choi a thumbdrive and warns that he hasn't hit the bottom of the sea yet. We view that remark through a panel of glass with a wavy mark cut in it. Nice. Choi watches the video, the one of himself threatening hyung, incredulous. December 31, 1992. Teen Dr. Han tries to call Sun-woo but can't get him. He suggests to the girls they cancel the train trip, and one of them leaves, but Future Mrs. H. won't let him off. She totally makes the two-fingered curse gesture she makes in 2012 and drags him off with a grin on her face. Ha. She's already got him around her little finger. Min-young shows up and Dr. Han lets her go upstairs. That white sculpture looks like it was made hastily of mat-board. He calls Dr. Yoon's office, who I assume is a brain cancer specialist, while she goes in and puts the room to rights (because Dr. Han had made a mess looking for the incense). Sun-woo wakes up and we get another famous conversation. I love that. It strikes me as hilarious. There is a last shot of the incense case in the fire. Everything around it is burning but it isn't because guess what? It's made of metal. And it's fireproof. There was a new time travel but it caused no changes, although Dr. Choi is getting some ideas. But no decisions have been made yet, so it's still the same time stream. December 30, 1992, 10:30 pm. After a quick view of Dad at his hospital office saying goodnight to the nurse, we pick up where we left off at Sun-woo appearing in his younger self's room. He pulls out his ID for proof of who he is, and asks teen self to call Dad and get him to come home. Originally Dad had been killed in a fire in his office and he wants him to get out of there. Here we get a new time line, because the intervention changes something. Teen self yells to Dad for help but gets knocked out (and a cut) in the resulting scuffle, and Dad heads for home. I would have called the cops. I guess it's not far though, because adult Sun-woo takes the family car and they pass each other on the road. Sun-woo sets up the cameras in Dad's office and calls teen self to get him to keep Dad at home. They need to meet the next day and he'll explain how to save someone's life. Then he watches on his computer as hyung walks into the office. He's completely shocked. Dr. Han in 2012 waits impatiently, looking at an article on his computer about Dr. Dad dying in the fire. It dissolves in smoke and reappears unchanged except with a time four hours later. Now we have Present3. Sun-woo reappears in his own time in his bedroom again. Interesting. He doesn't reappear in the place he was at, but in the place he left from. Min-young had gotten a lock-smith to get the door open. Sun-woo is curt with them and heads to work. Teen Sun-woo remembers suddenly that he was supposed to keep Dad home but Dad has gone back. He rides his bike over to the hospital, opens the office door, and is blown back by the flames. 2012 Sun-woo at work walks past a clock showing 11:30. He calls hyung to ask what he was doing the night Dad died but hyung doesn't admit anything. In 1992 we see medics bringing Dad's body out of the hospital in the daylight the next morning. Back in 2012 Sun-woo broadcasts the news for December 31. 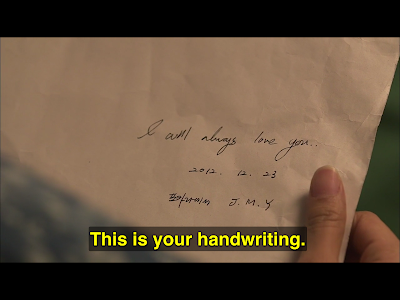 Dr. Choi texts that when he got to the hospital on that fateful night at 12:30, Dad was already dead. The fire was at 2 am. This is bad news for Sun-woo because if Dad died before 12:30 he doesn't have much time to fix it. He deserts the anchor desk and beats it over to the hospital. At 12:20 Dad of 1992 walks into his office and argues with hyung and then with Mom when she arrives. He drops the bombshell that hyung is someone else's son. Sun-woo arrives in front of the hospital, lights incense, and disappears into 1992. [tenth time travel: 41:09] It's 12:28. He hears Mom scream and runs into the office to see Dad dead on the floor with hyung kneeling next to him. Mom claims it's an accident as hyung hightails it out of there. He nearly gets run down by Dr. Choi, who sees the blood on him. Sun-woo chases hyung down, and catching up to him in an alley, grabs him by the shirt, ready to do mayhem, but disappears into 2012 as his time runs out. Running count – time travels: 10; remaining incense sticks: 3; Timeline: Past4, Present3. Happy Ides of March! It was two years ago today that Nampyeon and I started watching Korean Dramas. At the one-year mark I reviewed everything I had seen that year. Mostly they were older classic dramas that had finished airing. I looked on lists of people's favorite shows, and chose the ones with more fans and that seemed to have happy endings. Sometimes we agreed with the popular lists, sometimes not. Not until the end of the year did we branch out into some that were new and still airing. And then it was one that was heavily publicized. It really didn't make the grade, but by then we had discovered discussion groups. Bashing a bad show and sympathizing with everyones' remarks was almost as fun as watching a good show. Almost. We saw an amazing lot of shows that year. Maybe because we hadn't been watching tv for a long time and were surprised that there was a long list of shows that actually interested us. We inhaled two or three episodes a night, more on weekends. Until we decided we were spending way-y-y too much time on this and cut down to one episode a day. That first year we watched about 40 dramas. That is 40 mini-series, not episodes. This year we watched about half that. We also started a lot that we didn't finish. Some we only gave time for one episode before dropping, some we gave 10. But we learned not to watch something thinking it would get better, if we just didn't like it. There are too many out there for you to give your evening to one that bores or annoys you. We have been clued in to which dramas and actors were popular, which got buzz, which tanked. Yes, we discovered that we weren't the only people that thought dramas tended to go downhill half way through. We started getting favorite actors and even remembering the names of some of them. Which is something when you consider how alien they seemed to us at first, just a collection of odd syllables recycled and interchanged randomly. We have kept an eye on new dramas coming out and had some catch our interest before they even aired. Some of these were because of an actor, some because of storyline. Some justified our interest and some were disappointing but we definitely had our own opinions. It's time to post reviews of the last year's dramas. Luckily Nampyon kept a list of them all. While Sun-woo and Min-young are eating, young Dr. Boyfriend shows up with a fruit basket. He is so cheerful and cute I can't hate him. He just isn't Sun-woo, and he makes Sun-woo jealous. Ah well, I guess we have to have a love triangle. Sun-woo sends them out to dinner and when Min-young returns we get the famous conversation where she gives him the innocent kitten look and he admits that he had a girlfriend but she has amnesia and can't remember him. She objects and he says it's in dramas all the time and is the most common disease in the world. Hahaha. December 30, 2012. Dr. and Mrs. Han sit outside and argue about whether he is acting weird or not. (He is.) He asks about the girlfriend Sun-woo had as a teenager. She says that girl has been married three times and the second divorce was because of alcoholism. She doesn't say who was doing the drinking, but maybe Old Girlfriend was not such a bargain. December 30, 1992. Teen Sun-woo plans a train trip with said Old Girlfriend. He drags Dr. Han along and she talks her friend, the future Mrs. Han into coming, even though she thinks Dr. Han is smart but dull. Teen Dr. Han queries Sun-woo about the mysterious Christmas card, but he can't explain it. He can't explain his mother thinking he gave her a necklace either. She had asked him about his injured friend (which was his excuse for standing her up to see a movie with Old Girlfriend) and thanked him for the necklace. It was adult Sun-woo who had done those things. Dec 30. 2012. The family visits Mom at the care center and she still wears that necklace. Sun-woo feels strange because it's his first time to see his brother alive again. When hyung pulls up a sleeve to wipe a spill he exposes needle marks. He claims they are vitamin shots but Sun-woo is suspicious, especially when he finds a drug bottle in the car. They visit Dad at the charnel house and we see the urn labeled with the death date, December 30, 1992. 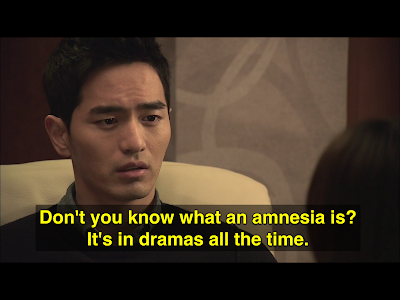 Sun-woo gets his sister-in-law to admit that hyung has a drug problem; she tells him that he's bipolar and has insomnia. She also tells him that Dad had not liked her and told her to break up. Still December 30, 2012. Dr. Choi holds a press conference to refute the allegations against his research facility. Then he calls Sun-woo and out of nowhere says that he is not the person who killed his father; it was someone else. He admits he had misused funds and forged documents and was suspected of the murder, but was found innocent. Sun-woo floors Choi by saying his father died at 11pm on that day twenty years ago, and there are two hours to go. He will find out for himself and call Choi back. He borrows some camcorders from the studio. 10:00 pm, December 30, 1992. Dr. Choi argues with some investors over the phone and then with Dad to try to get him to invest in his research. Dad is as harsh with Choi as with his son. 10:10 pm, December 30, 2012. Dr. Han going over paperwork recalls Sun-woo saying he couldn't resist time travel. We see Sun-woo throwing up and then calling Dr. Han. “You told me I had three months,” he says, “but it's gotten a lot worse over the last week.” He feels like the incense shortens his life. 10:20 pm. Dr. Han pacing his office recalls Sun-woo telling him that Hyung is addicted to Propofol and is still unhappy because their father died. He wants to go save their father. Young Dr. Boyfriend walks in with something for him to sign and scares him half to death. He asks Y. Dr. B. who his girlfriend is and when he affirms, “Min-young,” Dr. Han says, “It hasn't changed yet.” Hahaha. Poor guy. We pick up with Sun-woo and Dr. Han talking about the possible consequences of interfering with the past, since Sun-woo gave his brother's phone number to child Min-young. Neither of them detects any changed memories. But when Dr. Han goes into surgery, we see parallel clocks as child Min-young makes the call. Nothing happens until young hyung answers and then Dr. Han is flooded with new memories. [4:44] He is so shocked he drops his forceps. He pulls himself together enough to finish, and then we see him sprinting down the hall, our view alternating with one of hyung sprinting down other hospital halls to the ER to see his girl. Dr. Han finds an office door with hyung's name marked Chief. And up walks mature hyung, with his doctor's coat and a smile, alive and well. This is the scene that made my day in the preview. Sun-woo sits bemused at the restaurant as alternate memories cascade in [8:01] and is so shaken that he drops his glass. He asks the waiter if he came in alone, because in the other time line he had been with Min-young. He collapses and relives a memory of hyung's wedding, which is new, and one labeled December 30, 1992 of walking into his father's office and being blown back by the explosion, which is the same as before. The 30 conflicts with the 31 we were told in episode 3. Hmm. Min-young sits by Sun-woo's bed wiping his brow, which might have been helpful if the towel had been wet. He is remembering summer 2007 when she first came to work as a reporter. She now tells him she just returned from Nepal and calls him Uncle. It hits him that he has turned his wife into his niece, which makes him pretty much grumpypants the rest of the series. He goes to find Dr. Han, who is at the church praying but getting no answers. 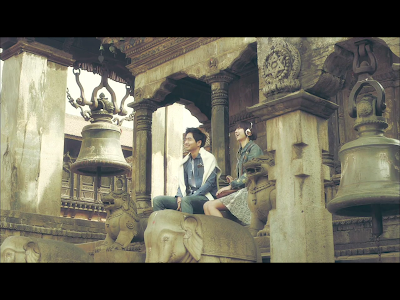 Sun-woo quips that the incense is from the Himalayas so they need to pray in a Hindu temple. Haha. They notice a conundrum. Hyung did not die in the Himalayas so Sun-woo didn't go to retrieve his belongings. Nevertheless, he still has the record and the case of incense sticks. For whatever reason items you bring back will remain. Also, even though both our guys remember the other timeline, Min-young does not. Remembering alternate timelines must hinge on whether you know about time traveling or not. Young Dr. Kang, the resident, refers to Dr. Han as his attending physician. Since I have a daughter in med school, I now know what that is, hehe. Dr. Han asks,“Did I set you up with Min-young last summer?” Kang replies, “You said you wouldn't ask!” but has to admit he still sees her. A flash-back to summer 2012 shows them being introduced. Dr. Han now hilariously whines, “Can't you break up with her?” He is totally having a cow at the whole situation, in contrast with Sun-woo who is somewhat non-responsive. Sun-woo gets a call from Min-young which he doesn't answer. His phone still shows the picture of her with the fur hood. It seems like he's still in shock to see her at his house cooking for him, and even more to hear his brother's voice on the phone. Hyung is on vacation, hears Sun-woo is not well, and says to let Min-young help him. We revisit Sun-woo's conversation with Dr. Han outside the church about memories that do not exist in this world. The problem is that neither memories of changed events or things you bring from the past disappear. Han asks, “How is it possible?” and he answers, “It's pointless to ask that. None of it is possible.” Maybe the point is that the whole story is a fantasy and not to expect it to make any sense. Too bad. I want it to have rules. At this stage we know that items you bring back and injuries you sustain will remain. You move exactly 20 years (to the minute) into the past, appear in the same physical space you were in, and stay there for 30 minutes. You remember events that get erased, and acquire memories of the new version when exactly 20 years to the instant has rolled around. Sun-woo leaves incense burning in his car and goes off to reconnoiter his dad's hospital of 1992, where he runs into Dr. Choi. [fifth time travel – 2:00] After that he sees hyung getting sloshed over losing his girlfriend and takes him home. He is first amazed to see dad alive, and then amazed to find that dad is harsher than he remembered. The incense runs out just as they are carrying hyung into the house and he disappears. December 24, 2012. In one of a trio of brightly painted town houses, Min-young wakes up jet-lagged. She and Sun-woo exchange cute text messages and she reviews pictures of them together in Nepal, in one of which she is shown sporting the fur-trimmed parka from Sun-woo's phone screen in episode 1. December 24, 1992. Teen Dr. Han finds a Christmas card on his desk at the study hall. [sixth time travel – 13:57 – although we don't see it happen, just the evidence of it] It is from Sun-woo and says he will get mail on that date in 20 years at 10 am, and then he will know what that card means. It's got a 2012 copyright mark. Back to Dec. 24, 2012. Dr. Han gets an email from Sun-woo right at 10 am telling him about the time travel incense. He remembers the card and does a creditable impression of Doc Brown running through the halls screaming. Haha! I thought he was totally overacting until I got the connection. He runs (literally, because he's out of breath) to Sun-woo's office for an explanation. He wants brain scans from age 30 on. Sun-woo thinks it will be hard to convince his past self. He decides to do what hyung had wanted to do first: get back his girlfriend and save their father. Sun-woo remembers opening the door to his father's office and being blown back by the blast; the entire room was in flames. Sun-woo uses an incense stick to go talk to the girlfriend [seventh time travel – 24:15] but finds she had OD'd on drugs. He gets her to the ER and gives hyung's phone number to her eight-year-old daughter, Shi-ah. When he disappears the camera tilts 45° and I am sure this time we will get dire consequences. Sun-woo and Min-young meet for dinner, but he gets a call about visiting his mother at the care center. He suddenly remembers he had stood her up on Christmas Eve in 1992 and runs out, promising to be back in half an hour. He had been supposed to go out to dinner with his mother and lied to her so he could go to a movie with a girl he liked. Mom had decided to go too and seen him there. This time [eighth time travel - 37:55] he steps on her glasses and takes her to a nearby optometrist for new ones. Into her purse he slips a heart necklace, that we later see she is still wearing at the care center. He returns to the restaurant majorly pleased with himself, and Min-young remarks he must be close with his mom. She is not, because her mom is difficult. She even had to change her name twice because of her mom; it used to be Shi-ah. Split-screen to watch 1992 Shi-ah dialing hyung's number. When he answers, we see 2012 Sun-woo's shocked face as Min-young disappears right in front of him. I am pretty shocked too; but seeing the preview for the next episode, where hyung wearing a doctor's coat walks up to Dr. Han with a smile on his face, leaves me with a lump in my throat. Usually in time-travel stories any changes that are made in a visit to the past are felt immediately in the future, but in this show things don't work that way. They change in the parallel moment twenty years from when someone in the past makes a decision that will cause the future to be different than it was the first time around. Hence, when Sun-woo returns from his seventh visit to the past, his world seems unchanged. It is not until young Shi-ah makes the phone call to hyung and he decides not to break up with her mother, that a change is seen. Min-young disappears in a puff of smoke and reappears in a new life; her mother disappears from a life with her second husband the Boston lawyer, and hyung disappears from the dead and has a new life as head of the hospital. We backtrack a teeny bit to watch Sun-woo light the incense again. [third time travel - 00:55] We hear the tech call his name, sounding odd, like a monk chanting, or as if from a Doppler effect. The news team has a cow about their missing anchorman while Sun-woo looks around 1992 curiously. In 2012 someone runs in to grab a case sitting on the counter by the incense holder, knocking it over. Sun-woo in 1992 has called the pager number and had time to figure out he is conversing with his teenage self before the 2012 furnishings rematerialize around him and he sees the incense stick lying on the floor, the ash knocked off and no longer burning. The tech verifies that the pager belongs to the study hall Sun-woo had attended in high school. Sun-woo calls Dr. Han to exclaim over the whole thing, and they both remember that the pager had been lost. We see a flash-back of the two as teenagers talking it over. Teen Sun-woo goes home and tries to tell hyung, but is brushed off. Hyung is preoccupied with telling his girlfriend goodbye because his father doesn't approve of her. Teen Sun-woo writes it up in his journal while adult Sun-woo reads it. He remembers writing it, but of course it is a product of time change and was different the first time around. Here we have one of the rules: 1992 and 2012 are marching along in parallel, and what gets changed in 1992 doesn't affect 2012 or even get remembered until that parallel moment rolls around exactly twenty years later. Sun-woo thinks about hyung wanting a return to the past and reads the little notebook that was found with the body. We get a flashback of hyung on the plane going to Nepal. It's January 5, 2012. He writes in the notebook, “Maruna Lodge room 201, under the window side mattress. Nine incense sticks that he left.” Sun-woo chews that over and returns to Nepal to look for Maruna Lodge. It had been torn down ten years previously, but he finds a guide to the spot where it had been. 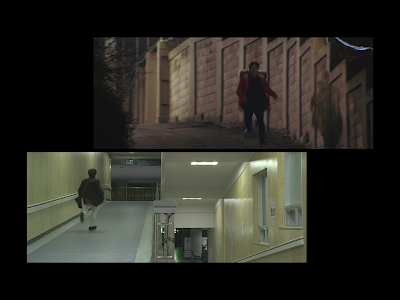 Split-screen shows us that he is indeed following hyung's footsteps and we're told it's December 22, 2012. We see (flash-back - 25:22) in a darkened empty cafe, a bearded man speaking English, telling hyung that someone had used the incense to save his family and not needed nine additional sticks, which could be retrieved. The bearded man dates that as 1992 and they were then in January 2012, so it had been 20 years since that man had gone to the Himalayas. It is after this interview that hyung flies to Nepal. It seems that the bearded man was not in Nepal, or in Korea either, or they would have been speaking Korean. The thought crosses my mind that the man who only used one incense stick could be Sun-woo in a different time loop, but there is no way to know. Hyung wrote in his book that the incense stick is 30 cm and burns for 30 minutes. This must be information from the bearded man. We are told their father died December 31, 1992, so hyung in January of 2012 would have had time to do something about it using the twenty-year jump. Sun-woo dictates a message to send Dr. Han and hikes up out of a forested area through dead brush and then to a bare snowy hillside. He lights his incense stick (he has ten minutes left on it) and disappears in a puff of smoke. [fourth time travel - 29:40] He reappears on the terrace of the Maruna Lodge twenty years previous, but surprise! It is surrounded by green trees and not a snowy waste at all. This I attribute to an oversight on the part of the production team, because it has to be December in both cases, and the surrounding vegetation should be the same. There is even a 1992 November-December calendar on the wall. Or wait – maybe the lodge had been watered by a hot spring. Are there hot springs in the Himalayas? At any rate, Sun-woo finds a beautiful turquoise lacquered incense case but has to fight it out with the locals. He luckily has hold of the case when the original incense stick burns out and returns him to the present, bringing a record album that was in his hand as well. We open with Dr. Han running an ER and getting after a couple of interns for watching Dr. Choi on tv. One of them is Kang Seo-joon, played by Oh Min-seok, who we remember as an assistant manager from Misaeng. He is going to be Min-young's boyfriend. Min-young calls Dr. Han and he tells her about the tumor. Speaking of which, we watch Sun-woo painfully endure another sudden headache. Then he notices the incense stick and lights it again. [second time travel - 13:45] He tries to use his phone but has no connection. When he looks around, his room has changed to the way it was when he was in high school, featuring a poster of the DeLorean from Back to the Future. He finds a pager and has a run-in with his Mom, who we have seen as a catatonic mental patient; his Dad, who died when he was young; and a teen-age hyung, who swings a bat at him. A huge fish tank breaks and he is cut by the glass. Dazed, he returns to his room, only to have his phone beep and his room turn back to the way it had been. The incense has gone out again, but he still has the cut. Sun-woo has visited 1992 and changed history. The fish tank gets replaced by a modern sculpture and his family remembers an intruder. They are in Timeline Past2 now. He has a pager in his pocket and a sculpture instead of a fish tank in his house. He goes to the ER for stitches and gets a lecture from Dr. Han, who wants him in chemo stat. At work, he takes a call from Min-young in Nepal, who is angry at him. His housekeeper is dusting his room when the pager goes off. [a time incident, not a time travel – 36:52] He has her send it to him and asks a techie to find out how old it is and who had the number. He talks to Dr. Han on the phone about seeing things when the incense stick is lit and wonders if it is a drug. It would be pretty lame if the whole show were a hallucination caused by the brain tumor or a drug. A courier delivers the pager and incense stick, which he lights. [third time travel - 42:22] We get a split screen as he looks around the room in its 1992 décor, and the tech enters in 2012. Same space, different times. The tech doesn't find him and leaves. Our guy is freaked out to find a newspaper dated December 21, 1992 and when the pager rings again he calls it back on a desk phone. The person answering is his teen-age self wanting his pager back. The pager ringing is a puzzle. The first time it rings, teen Sun-woo is calling it from 1992, so why does the signal register in 2012? It was not caused by the incense, at least it wasn't lit. Are we saying electromagnetic signals travel across time? The second time it rings it makes sense because the pager has gone back in time with Sun-woo. Some of the group members feel it may be that since he had owned the pager, he has a personal connection; and that it works because the required tech support is there. Or that since this show was written by the writers of Queen Inhyun's Man, it may just have similar mystical telephones. Perhaps it is just the quirks of a mystical power, and we are expecting the well-ordered working of a machine built by Doc Brown. Nine: Episode 1, Time Travel? I belong to a kdrama facebook group that has decided to watch Nine: Nine Time Travels together. I loved that one, and scoured lots of blogs looking for a good explanation of that confusing and ambiguous ending. Yay for talking it out with people! If I ever get a chance to meet a celebrity, I'm going to choose writer-nim and ask her exactly what she meant by that ending. And now that I'm going to rewatch, I'm going to keep track of all those crazy timelines. The very first scene may be a clue. We have a shot from the air of mountains covered in snow. According to the story they are meant to be the Himalayas, but you couldn't tell them apart from the mountains of New Zealand. Especially since music from Lord of the Rings is playing. I am already happy, because I think it's a clue that this is a fantasy. We see someone who turns out to be hyung walking up the mountain accompanied by an epic elf chorus and then a flute. (The hobbit theme is played by a flute, but this is a more somber song.) He tries to light a stick of incense but falls and starts to freeze to death and we hear footsteps; someone's shadow falls on his face and he looks up. Change scene to our hero flying into Pokhara, Nepal, on December 15, 2012 (yay for a firm date). He's unshaven, which might be important later, and greets the heroine with a surprise smooch only four minutes into the show. They bicker and he teases her. He's kind of a jerk, but not your standard kdrama chebol jerk. He asks her to marry him for six months. Then he goes to the police station, where they give him hyung's belongings and say he died a year before. What? Hyung is dead? Didn't we just see him get rescued? That first scene didn't have a time-stamp on it and could be a sneak peak at the end of the show; otherwise how does it fit in? In a flash-back dated a year ago (December 2011, and presumably just before dying in Nepal) hyung meets Sun-woo in a cafe in Seoul, needing money and hinting that he wants to return to the way things were back when their father was alive and their mother healthy. He is very nervous and looks a little unbalanced, and says if he told Sun-woo the whole story he wouldn't believe it. When he gets up he is in his room again, but we see that the burning incense has hit the edge of the holder and gone out. He thinks he was hallucinating, but it seems to us like time-traveling. Except. The rules of time-travel weren't followed here. In every other case he gets moved back twenty years but doesn't change location. This time, he was either moved, or the hotel hadn't been built yet. But it's in town, surrounded by green trees. It could be that in changing owners, the incense stick sent him to the last place the previous owner had tried to light it - where hyung had been. Or it could have been a warning sent by the magic. In either case, it seems to be hiccuping and having a hard time staying lit. We skip to a few days later. Getting ready for a tv interview, Dr. Choi says he thought Sun-woo was abroad and is told he had been back for over a year. During the interview he goes off-script to ask Dr. Choi some embarrassing questions about his research. Everyone is upset. His boss endearingly stands up for him to the network brass, but yells at him and suspends him. Sun-woo hands in his resignation and we discover that he has a brain tumor, with six months of normal life left. (Hence the six-month marriage.) He asks Chief Oh to keep pushing Dr. Choi and gives him a thumb drive with evidence on it. Min-young calls him from Nepal. The picture on his lock screen is of her wearing a fur hood, which we haven't seen her wearing. He doesn't tell her about the tumor, just that he doesn't want to get too attached. In reality he doesn't want her to get too attached.